Posted March 20th, 2014 by Simon & filed under casino, slots. If you missed the Master Millions Slot Tournament at the Bellagio in Vegas, don’t worry. 2014 can still be an amazing year for you with a wide array of gambling events no matter what your game. Where ever you call home, there’s an exciting event near you. Check out the following tournaments. One of them could be your ticket to riches. Slot tournaments occur regularly at most casinos. If you’re interested in participating in one, check to see whether it’s an open tournament or one you have to qualify for. Either way, they are a fun way to experience your favorite game. $500,000 High Stakes Challenge, Bellagio/Aria/MGM Grand – Las Vegas, Nev. These three casinos are teaming up for some of the hottest, high stakes play on The Strip. The event is invitation only. National TournEvent of Champions(R), Las Vegas, Nev. This is a qualifying tournament, comprised of winners of semi-annual events at participating casinos across the country. It’s big, it’s loud, it’s not like any other slot tournament with $500,000 guaranteed cash and prizes. It features a leaderboard and plenty of interactivity during the tournament. $80,000 EZ Money Slot Tournament, Island View Casino – Gulfport, Miss. Open to anyone who earns 20 points. The top 50 scorers get a share of the Slot View Play. Spring Clean Up Slot Tournament, San Manuel Indian Bingo & Casino – Highland, Calif. This exciting $30,000 slot tournament in southern California awards the top 50 scorers cash for a $50 buy-in. $150,000 Black Jack Tournament, Paris – Las Vegas, Nev. This is a free entry, invitation-only event with elimination format. Black Jack Blowout, Kewadin Casino – St. Ignace, Mich. The entry fee is $275 and includes your hotel stay. The prize pool is $30,000. The entry fee for those not requiring a room is $200. This event is held several times throughout the year. $100,000, Tropicana – Las Vegas, Nev. This open event with elimination format has an entry fee of $499, which includes three-nights lodging. A guest will be compensated on his/her lodging (in the same room) and entry into the event. One of the most scenic tournaments around, this event marries a cruise vacation with beloved bingo play. When the ship is at sea, tournament play occurs. When it docks you can explore the natural beauty of Juneau, Skagway, Ketchikan and Victoria, B.C. Palace Station $75,000 Big Game Bingo Event – Las Vegas, Nev. Entry fee is $99 and includes two complimentary daubers and buffet tickets. Specials are also available for hotel stays during that time. Each day of the tournament, Palace Station pays $37,500 to winners. While Lady Luck is always the best travelling companion to events like these, practicing your online gambling skills before you leave home is a great idea. The competition at these events is fierce so take some time to practice online first. Posted March 17th, 2014 by Simon & filed under slots. 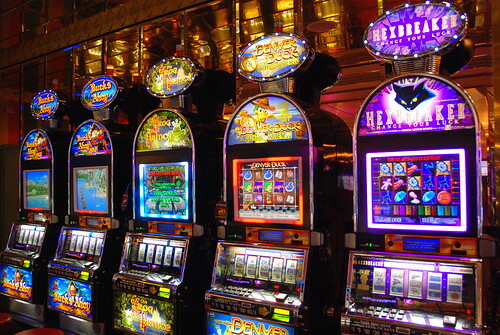 Invented in 1891, slot machines are classic casino games. With their flashing lights, sound effects, and varied themes, slot machines create a casino’s atmosphere, almost exuding an aura of excitement and possibility. The allure of slot machines is undeniable – stepping up to a machine you instantly want to pull the lever or push the button to see if you can win big. Take a breath and step back for a moment. Here are four tips to keep in mind as a novice slot player. When choosing your machine, look for a card on or near the machine. This “pay table” will show you the combinations that will pay out on that machine. Some slot machines pay small amounts frequently; on other machines, you’ll almost never win, but when you do, it’ll be big. Decide what kind of game you’d like to play, then use the pay table to find the right machine for you. A progressive slot machine is where a small percentage of all the money entered into the machine is added to the jackpot until someone wins it. If no one wins for a while these jackpots can get outrageously big – making them exhilarating to try to get. However, if this is the game you want to play, make sure you play “full coin” – meaning, you make the largest bet possible on the machine each time – because that’s the only way to win the jackpot. If you win a substantial amount of money, set aside the amount you started with, plus some profit, before continuing to play. Although this might seem obvious, this rule is one of the hardest to follow when you’re actually in the casino (which is actually why some people prefer online casino gaming – less pressure). It’s incredibly tempting to chase the high of a big win with more slots, but try to resist. There are few worse feelings in this world than going from a large profit to deep in the hole. Instead, take a short breather. Do a victory lap, and then continue to play with a small part of your profits. Keeping a journal of your wins and losses will help you in several ways. First, if you win more than $1,200 the casino will give you a W2-G form to declare your winnings to the IRS come tax time. If you have a record, you can write off your losses, potentially saving you a lot of money. Second, keeping a log will help you manage your money. Being able to see exactly how much you’ve spent and how much you’ve won during each session of play will help you plan for the future. Finally: make sure you have fun. If you win money, that’s great. If you lose, think of it as paying for entertainment. The most important thing is enjoying the game. Posted March 14th, 2014 by Simon & filed under slots. Slot machines are a complete gaming experience. You’ve got all the thrills of a possible big win, plus the promise of a prize you can actually use: money. But if you’re looking to take your slot gaming to the next level, then video slots are the way to spin. Here are the top eight slot machines with awesome themes that are sure to keep your eyes on the reels. The Aztec’s Treasure theme positions you as a brave explorer searching for ancient wealth. This isn’t your average video reel. Throughout the game, you’ll encounter narratives from princesses and even the Aztec King himself; all while playing up to 20 lines. Aladdin’s Wishes is no kid’s game. The genie is slightly more mischievous than the darling Disney movie. This Arabian-inspired game features scattered magic lamps; find three and you won’t get wishes – you’ll likely get a bonus round. There’s something slightly eerie about the Haunted Opera theme. Maybe it’s because, at any moment, you could uncover the phantom’s mask. However, the mask actually represents a wild symbol that could double your prize. Ever wondered what it would be like to be a wok chef in a fast-paced kitchen? Play the Wok & Roll theme and you’ll find out when you cook up to 25 lines of ingredients with each spin. Land a Wok & Roll and you could get up to 10 free bonus games. If you’re looking for something a little more whimsical and sweet, check out the Enchanted Garden theme. Mythical unicorns and ethereal flowers set the scene. Find the fancy fairy princess and you’ll win double. Play up to 20 lines for a full on garden party. Laugh all the way to the bank with this Three Stooges themed slot game. Players can experience up to 25 lines of laughs (re: knuckleheads and other Stooges nostalgia). With just 5 cents per line bet, there are plenty of opportunities to win big. Play three different feature games: Larry, Moe, and Curly, of course! Each game features a scattered character head for free games and prizes. Food Fight looks like a classic style slot, with less than messy finish. Fling (re: spin) cafeteria-style snacks. This is a better’s game and you could win more than just a place in the buffet line. Once you’ve placed your bet, spin to reveal your foodie stack. Video slots make for hours of virtual fun. What’s your favorite slot machine theme? How do you choose which game you’ll play? Share your thoughts in the comments below. Online slot machines are often referred to as “mobile” slots. However, most other terminology is the same as traditional casino jargon. If you’re looking to spin the mobile reels (see below) for a win (we’ve got you covered on this too), then get acquainted with the following lucrative lingo that helps any first-time player get in-the-know. Bet refers to the amount of coin put toward a single payline. Players will be paid out only if they land on the particular payline; however, multiple bets can be place to increase the odds for payouts on additional lines. For more information on paylines, see below. Bet Max – Bet max refers to the maximum possible bet or coin that can be put toward a win. Standard bets are not eligible for jackpot wins, where maximum bets are. Bonus – A bonus, or bonus game, results when a spin results in a wild symbol/card, and it may result in a free spin. Bonus features can be rewarding for slot players since it offers more chances to win. Multiplier – Multipliers are features within a bonus that allows for a multiplied jackpot payout. Players must typically place a maximum bet to be eligible for multiplier bonuses. 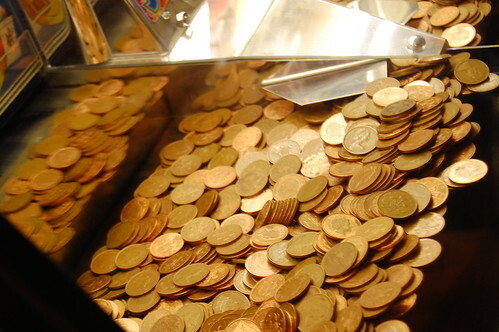 Coins – Coins used to play a slot machine game. Coins may come in multiple values. Furthermore, in online slot play, they may be called virtual coins. Coin Size – A variable wager or bet based on the amount of coin the player puts toward the machine. Jackpot – The maximum possible prize or payout for a given slot machine; jackpots are rare, but typically extremely profitable for players. Progressive Jackpot – A machine with a jackpot value that increases as the game is played. Payline – Payline refers to the line of symbols and numbers on a slot machine that result in a win with payout. A player must spin the reels to reveal a payline. 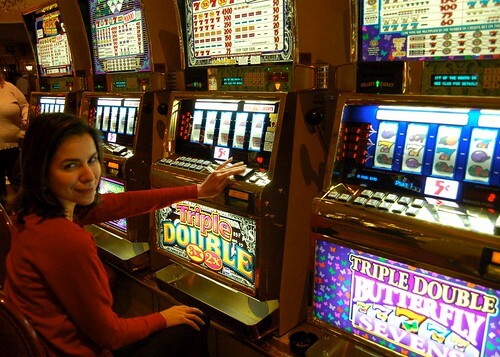 Multi-line – Slots that have more than one possible payline or winning combination. Scatter – Scatter symbols do not have to line up in the same way as a payline combo. Scatter symbols will payout regardless of the line in which they appear. 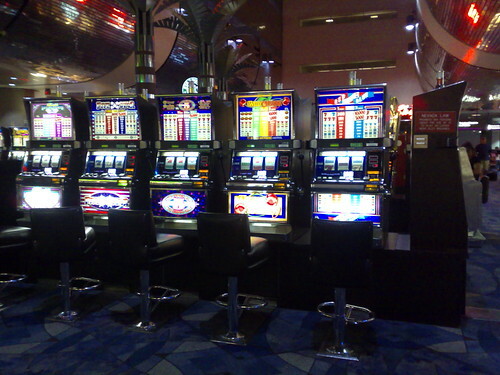 Reels – The reels are each wheel inside a slot machine that contains numbers or symbols. When the reels are spun, the will land on various combinations resulting in a win or loss. In online gambling, reels are virtual or animated. Different slot games may have multiple reels. 3 Reels – A slot machine with three reels which results in a three item combo. 5 Reels – A slot machine with five reels which results in a five item combo. Wild – Wild symbols offer a substitute for a payline that’s not fully met. For example, if a player spins the reel for two payline symbols plus a wild symbol, the player wins the spin. Win – A win, also known as “Winning Combination,” refers to any combination that results in a payout. A win may consist of payline wins, wild symbol wins, bonuses, and jackpots. Now that you know some lucrative slot machine lingo, will you take the reels for a spin? What’s your favorite gambling experience? Share your thoughts in the comments below. Posted August 21st, 2013 by Simon & filed under slots. There are many different slots games to choose from – we know, because we sifted through hundreds of different websites, each with around 100 or more slots titles to choose from when we set out to make rickross.com. One of the questions that we get a lot via email concerns the approach that we used to ultimately pick the casinos that we did. We’re going to explain the key factors that we look at when when deciding which casinos we should include on the website. Then, we will explain how we use those factors to ultimately bring the very best options to our readers. This will be an in-depth examination of our entire methodology, so play close attention because the Rick Ross “secret sauce” is about to be disclosed. Look, there is even a table of contents. Did you know that slots games are (not) typically coded up by the casinos themselves? Rather, they license the software from other companies that specialize in the creation of digital gaming platforms. So, the first thing you want to take into consideration is what type of software the casino happens to be using. If you see that the casino you are considering is using one of the big names (below), then great – you can probably expect some pretty consistent plays and pays there. If it is something else, you can probably expect, well… something else. As of 2013, these are the top three platforms according to Rick. Cick on the links for more information, check out our Bingo Page, featuring more on the Rival software, or keep reading for more slots information. One of the advantage with slots is right there in the plurality of the name: slots—with an ‘s.’ There is a whole universe of options to to choose from. It can be kind of intimidating, but at the same time it’s super easy to handle if you get that all slots break down into a few common archetypes. The ‘Old School’ 3-reel variety: this is the format that everyone knows and many still love. 3 reels. Usually little-to-no bonus ’round’ of any kind. You are trying to align symbols and little else. The ‘New School’ many-reel variety: this is the format you might be most used to seeing if you are younger. They have for the most part taken over most casinos. They are digital, and will traditionally include some sort of an overall theme (beyond the usual slots symbols). They will also usually feature a bonus round (see more below). The’Honeycomb’ variety: this version of slots gets its name from the fact that each ‘slot’ area is dimaond shaped, with the entire slot facing forming what looks like a honeycomb due to the nature of the interlocking diamond slots, which is not unlike a bee hive. These slots are a little different in that players will usually have to connect three or more symbols starting at a ‘choke point’ near the beginning where one diamond splits into two (and four, and so on) The effect is that if the first diamond doesn’t hit, then the rest are not going to either. In effect, these games usually have a high volitility. (More on that term below). Unless you are more on the old school type, the bonus round is the main reason that you are going to be playing a slot machine. It’s where the real excitement happens. It is the moment where you are most likely to hit the type of huge win that all gamblers are ultimately playing to achieve. Here are the main types of bonus rounds that will be found in any given slot title. Selection that Ends the Game: as the name implies, for this bonus, you are trying to avoid that one selection that ends the bonus round. Bonus Spins: you are awarded with free bonus spins. Usually automatic. Static Credit Amount: you are awarded with a predetermined amount of credits. This type of bonus is not as fun, as there is no selection or relevative excitement involved compared to a normal spin. Max Spin Progressive: is a bonus that is (typically) only awarded if you are playing the max spin. Progressive wins can pay off dramatically as these jackpots, while rare, are among the highest paying bonuses that exists. Sometimes in excess of a million dollars. The majority of the casino slots bonuses available are either designed for, or most benefitted by playing slots (as opposed to say a table game.) This is good to know, and with the right additional knoledge, you can really benefit from using these casino bonus codes. In fact, it’s almost a requirement because it’s basically free money. That is for the most part why this website exists. Deposit Match Bonus: This type of bonus is often referred to as a ‘100%’ bonus code because the casino will match your deposit amound with 100% of the amount in additional gambling money for free. So for example, if you put in a $800 deposit, then you would get $800 in free cash. This is the standard bonus. If you are not getting at least this amount, we do not recommend playing at that location. No-deposit Free Spins Code: These are the least-known types of codes, but they are actually pretty cool: you just get some free spins. You don’t get any money technically, but if those spins happen to win, then it’s like you paid for the spin anyway. It’s as close to getting money as you can get, and for the most part the playthrough requirement on your winnings isn’t as bad as what it might be for a no-deposit bonus. These two words are the wild sisters of the slots world that basically represent the frequency for which the slots game before you will be paying out. Some slots games will pay out more often than not, but the amount is also low more often than not. Those are examples of games with low variance. Some games will pay out very infrequently, but they will pay out extremely large sums when they do. Those are examples of games with a high variance. Another way of lookng at it is sort of like the experience of a roller coaster. Games with a high variance are a wild ride where you are constantly scared for the life of your bankroll: you are losing big, but you are also winning big – sometimes very big. Some players enjoy these types of games, whereas some do not. So long as you know what you are looking for you will be able to adjust your gameplay accordingly. There is really no right or wrong decision when it comes to variance; it’s about the experience. If you’re still reading, fantastic! It’s time to take a look at how we bring all of the above variables together into our finalized casino lists. First, our team of players (see: rick and his friends) make a deposit using the best-sounding bonus code and we give the software a go. Second, we monitor for wins, loses, and the overall ‘feel’ of the casino. Fourth, even if we don’t really need to, we will make an effort to get a hold of the customer service to test out the level of professionalism found therein those departments. Fifth, we will often repeat steps one and two with another credit card. For the slots, the above considerations are tempered with respect to the above-mentioned variables that make up a great slots experience: the slot style, the bonus style, the bonus codes play style, and of course the software that everything is running on. And that’s it! We hope the above information was helpful in explaining the ‘behind the scenes’ action that happens here at Rick’s Picks. If you are all jazzed up on the idea of playing some slots, then definitely check out our best casinos slots list and grab yourself some of the bonus codes that we talked about and start playing just like Ricky does.